I thought I would share this little blurb I wrote when I had a mild creative stroke before a recent presentation. As an exercise in a class I am taking, we were conceptualizing dance as a future form of communication, and thus reporting its value as a form of non-verbal expression. 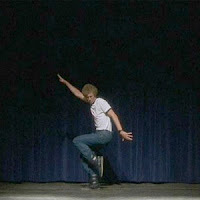 I, for some reason, thought of this scene in Napoleon Dynamite as relatable to the possibilities of dance as a yet-to-be-fully-understood language – my reasoning is that we can convey messages and emotions through dance when language sometimes fails us and the puzzle is we can’t really explain why other than little theories about kinesthetic connections. So here is the blurb (and the video clip of course because… well of course). When I think of how dance can be an integral facet of communication of the post-literate future, I can’t help but use the example of Napoleon Dynamite. In the 2004 film, outcast Napoleon has trouble communicating with the rest of the student body because of his otherness. He doesn’t relate to any of the students other than two outsiders. Tormented by his otherness, and other students, he begins to tell fantastic stories about himself as a defense. Napoleon, desperate to be understood, first attempts at communicating with the student body by joining the Happy Hands Club – a student club that perform sign language to the lyrics of popular songs. However, because of the barriers inherent in the language, he is unable to craft an original message. It is only when Napoleon finds an instructional video on dance does he succeed in sending a message to his fellow students in a penultimate dance scene. With this dance, he is able to communicate directly to the student body, who in turn react to the performance with a standing ovation – an explicit understanding. Using dance as a tool, our hero is able to communicate, and perhaps own up to, his own unique culture.